CLINTON, IA - DECEMBER 28: Republican presidential candidate and former Massachusetts Gov. 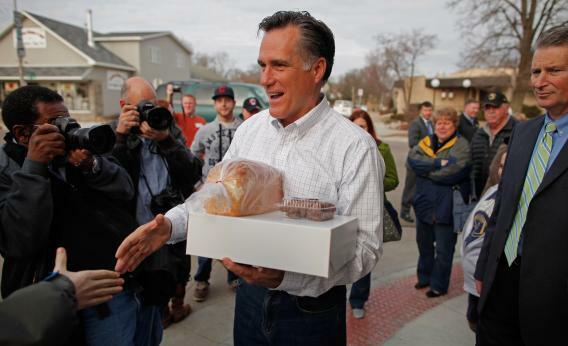 Mitt Romney (C) shakes hands as he leaves a campaign event at Homer’s Deli and Bakery with a stack of baked goods December 28, 2011 in Clinton, Iowa. With less than a week before the all-important Iowa Caucuses, Romney began a three-day bus tour of the state Wednesday. Mitt Romney’s best shot at capturing the White House is convincing Americans he’s the guy to turn the economy around, channeling lingering unemployment, a steep drop in household wealth, and a general feeling of malaise into a rejection of Barack Obama’s presidency in November. This is not to argue that throngs of voters will have these goofy moments fresh in their minds when they cast ballots months from now. But every time Romney betrays his elite upbringing and effete mannerisms – the guy spent the Vietnam War in a French palace, for God’s sake! – he sets himself apart from the working-class white voters he needs to sweep to have a shot in states like Ohio and Florida. What do these moments tell us? Well, that Romney should steer clear of baked goods at campaign events, for one. But more seriously, his economic case has to ride less on his being in touch with everyday Americans – no one will buy that – and more on his having the managerial background and technocratic expertise to right the ship.